Nasi Bamboo Sungai Klah is a famous place in Sungkai, Perak (otw to Slim River). It is always jam packed EVERYTIME we pass by that area. Cars parked alongside the road despite them having a large parking space in front of it. Except on Fridays of course since it is closed. The day we went, Tuesday (29th August), there were still cars parked alongside the road but not as many as we've seen before. Tried our luck to park inside and Alhamdulillah ada. Sofia was sleeping soundly in her carseat... Not wanting to waste a chance, we decided to just carry her inside. WOW! It is huge..! Imagine a foodcourt. Well, it IS like a foodcourt. 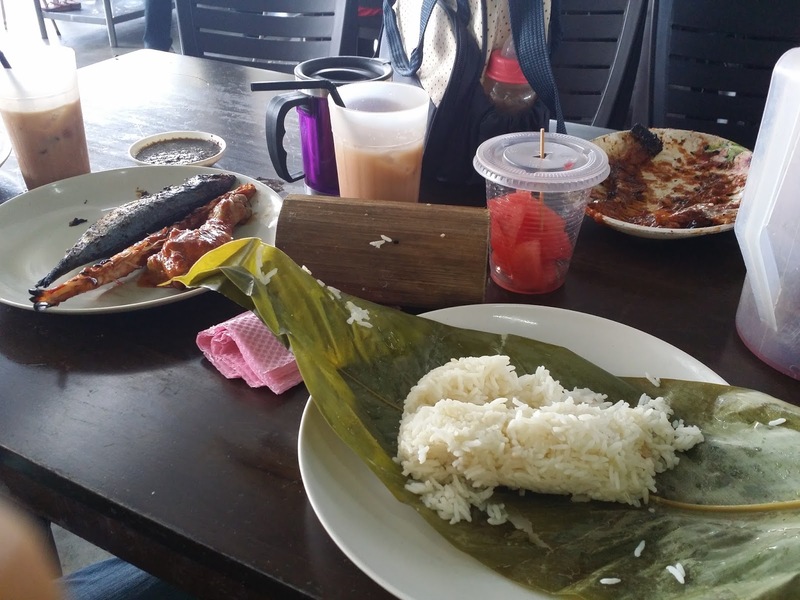 There were separate counters for the nasi bamboo, lauk-pauk (there's even kambing bakar! ), drinks, and also for goreng-gorengan like pisang goreng and keropok lekor. There is also a gift shop! Not really a physical store, but more like a booth. Rice wrapped in a leaf in a bamboo. That's what you will get if you dine-in. One nasi bamboo costs only RM 2.10, ala-carte. The nasi only. You can also buy a set around RM 3, which includes some ulam, ikan masin, and a few other things. Sorry for not being very detailed on the price. 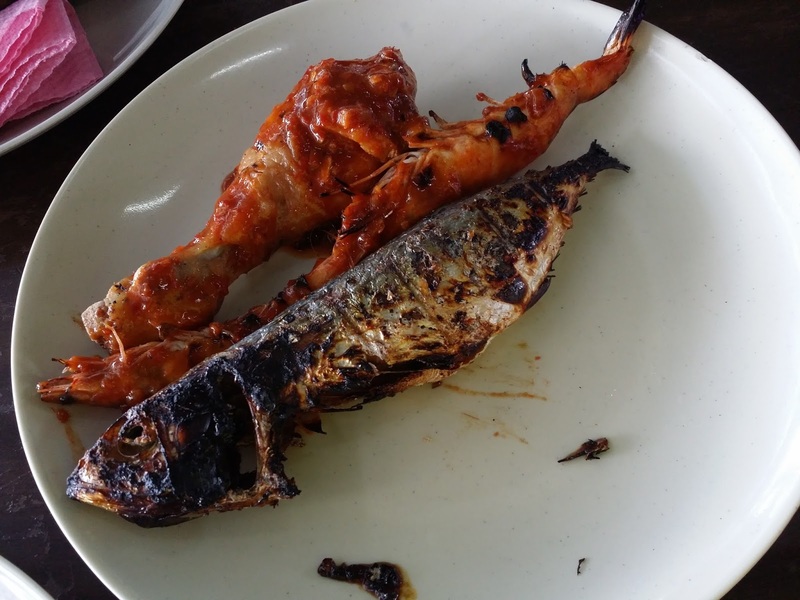 Ayam percik, udang 2 ekor, and ikan bakar. All three of these total up to RM 15. Membungkus. Well, my husband and I decided to tapau for those at home. I feel like I should write about this to warn you guys in case you had the same thinking like my husband and I. This is what it looks like out of the buluh. Got the daun and nasi. Makan panas-panas hoi memang sedap. That was exactly why we decided to tapau. 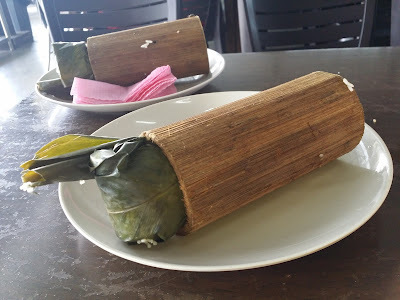 You see, while waiting for my husband to tapau, I kept looking at the bamboo thinking how we are going to re-heat the nasi in the bamboo later on back home. I also thought of other uses of the bamboo. My husband came back holding a red plastic bag; no bamboo to be seen inside. Only three brown packages. Smiling, half laughing, he said, "Tak dapat buluh"
But you still got the leaf, though.